Uncle Milton, creator of the innovative Star Wars™ Science brand of toys, is getting ready to challenge aspiring Jedi in a different way. This time, Uncle Milton will be bringing the popular artificial intelligence game of knowledge, 20Q, into the world of Star Wars with the Jedi Holocron. Holocrons are artifacts that hold an indeterminable amount of knowledge, so what better way to bring the Holocron into our world, than with 20Q. Even better, Star Wars™ fans can be part of the creation of this new Star Wars™ Science Jedi Holocron! Just visit 20q.net, click on the Star Wars logo and follow the instructions. Think of any person, place, or thing based on all 6 Star Wars movies and TV series and 20Q will try and guess what you’re thinking. See if you can outsmart the Jedi Holocron! The more times you play, the smarter the artificial intelligence of the Jedi Holocron will become. Look for the Star Wars Science Jedi Holocron on store shelves beginning in Fall, 2015. In addition, Uncle Milton is also releasing a new version of their very popular Star Wars Force Trainer. In 2009, one of the most innovative Star Wars toys of all-time was launched–The Force Trainer. This incredible toy enabled fans of all ages to move and control an object with the power of their mind and quickly became a hit with Star Wars fans and the media worldwide. Just as the next generation of Star Wars movies is preparing to launch, Uncle Milton’s Star Wars Science brand is introducing The Force Trainer II: Hologram Experience. The Force Trainer II features new technology being unveiled at CES and gives Star Wars fans the opportunity to harness the power of their mind to move and control hologram images as they perform incredible Jedi feats from Star Wars movies. With The Force Trainer II, you are the Jedi. Imagine that you could raise an X-wing from the Dagobah swamp just like Luke Skywalker, battle Darth Vader, or build your own lightsaber with just the power of your mind! These magical scenes are re-created through hologram images and a wireless headset with real brainwave sensors that read and interpret your levels of concentration. The more you focus, the more successful you are in moving and controlling the hologram image and successfully completing the Jedi challenge. 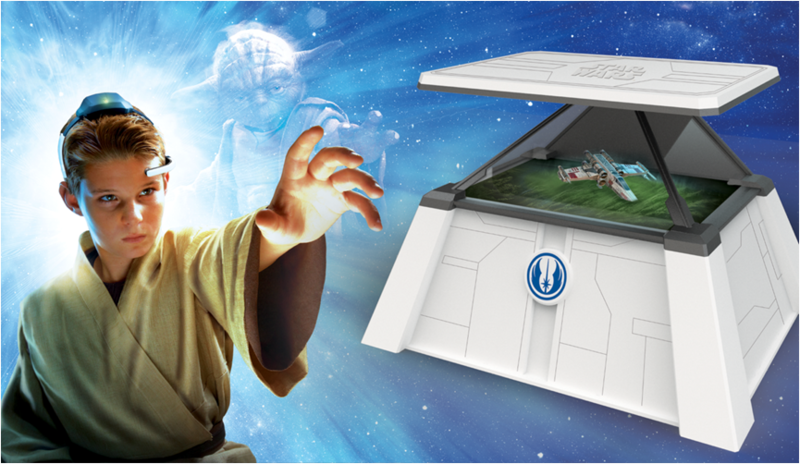 The hologram images and Jedi challenges come through a companion app included with the purchase of the product and powered by the user’s tablet device which projects these holograms into the unique Jedi themed training base. There are 10 different Jedi training levels through which fans can advance from Padawan to Jedi Knight to Jedi Master, with instruction and guidance from Jedi Master Yoda. Additional Jedi challenges will also be available for download on updated versions of the app as new Star Wars movies are released. The product is expected to hit retail stores in Fall 2015 with an estimated SRP of $119.99. Hear a review of Uncle Milton’s original Force Trailer in Episode 229 of the Star Wars Action News Podcast!